Please go to Start > Control Panel > Programs and Features . 1.2 Install latest Java 7 update. Click this link and click on the Free JAVA Download. 1.3 Find here instructions how to clear the java cache. Note: This deletes ALL the Downloaded Applications and Applets from the CACHE. Click OK to leave the Java Control Panel. Download the free version of Malwarebytes' Anti-Malware and save it to your desktop. Double-click mbam-setup****.exe and follow the prompts to install the program. Note to Vista | Windows 7/8 users, please right-click and select Run as Administrator. Make sure a checkmark is placed next to Update Malwarebytes' Anti-Malware and Launch Malwarebytes' Anti-Malware. When completed, a log will open in Notepad. Please copy and paste the log back into your next reply. Note 1: The log can also be found via the Logs tab when Malwarebytes' Anti-Malware is started. Note 2: If you receive a notice that some of the items couldn't be removed and they have been added to the delete on reboot list, please reboot. Connect any existing external hard drives and / or other removable media. I removed old versions of Java but could not install the new version. The installation failed and I received a "getdefaultBrowserError:2" message. C:\RECYCLER\S-1-5-21-3172651036-2704603105-3109081277-1005\Dc1.exe (PUP.Optional.ExpressInstall.A) -> Quarantined and deleted successfully. Then post Fix OTL log as well as a new OTL log by rerunning it after reboot without custom scans script. Please download JavaRa to your desktop and unzip it to its own folder. Run JavaRa.exe, pick the language of your choice and click Select. Then click Remove Older Versions. Select Update Using Sun Java's Website then click Search and click on the Open Webpage button. Bad news - i ran the OTL with the fix and then again after the reboot and those logs are below. However I was unable to get JRE to load again. When I ran the javara wizard in step 1 it could not find the unintaller. I ran step 2 which found lots of items associated with JAVA and removed them. I then ran step 3 (download new JRE) and it never finished. I closed the wizard and tried to download again mannually and still received the getdefaultbrowsererror 2: message. Now for the bad news, the site you took me to (or the one I ended up on) for down loading the Javara - had malware and it re-infected me. I ran the AdwCleaner again and it found lots of items. This log is shown at the end. Unable to delete ADS C:\Documents and Settings\All Users\Application Data\TEMP:62E2D794 . ADS C:\Documents and Settings\All Users\Application Data\TEMP:5C321E34 deleted successfully. C:\Documents and Settings\Jeff\Application Data\Sun\Java\Deployment\cache\6.0\57\8eb45b9-7ef58dbd moved successfully. Computer Name: JEFF | User Name: Jeff | Logged in as Administrator. I'm so sorry to hear about that. Run Junkware Removal Tool again. Vista / Windows 7/8 users right-click and select Run As Administrator. Double click on the OTL icon to run it. Make sure all other windows are closed and to let it run uninterrupted. Successfully deleted: [File] "C:\Documents and Settings\Jeff\appdata\locallow\SkwConfig.bin"
Do not remove found threats and post the log. Please go to Start > Control Panel > Add Remove Programs. Remove the check mark from the box "Install Chrome as standard browser and Google Toolbar for Internet explorer"
ADS C:\Documents and Settings\All Users\Application Data\TEMP:D346F792 deleted successfully. File\Folder C:\Documents and Settings\Jeff\Local Settings\Temporary Internet Files\Content.IE5\73PAT3FU\c.gif not found! File\Folder C:\Documents and Settings\Jeff\Local Settings\Temporary Internet Files\Content.IE5\73PAT3FU\desktop.ini not found! File\Folder C:\Documents and Settings\Jeff\Local Settings\Temporary Internet Files\Content.IE5\73PAT3FU\dt131102.jpg not found! File\Folder C:\Documents and Settings\Jeff\Local Settings\Temporary Internet Files\Content.IE5\73PAT3FU\editor.css not found! File\Folder C:\Documents and Settings\Jeff\Local Settings\Temporary Internet Files\Content.IE5\73PAT3FU\esetScanArchives.png not found! File\Folder C:\Documents and Settings\Jeff\Local Settings\Temporary Internet Files\Content.IE5\73PAT3FU\favicon.ico not found! File\Folder C:\Documents and Settings\Jeff\Local Settings\Temporary Internet Files\Content.IE5\73PAT3FU\g.gif not found! File\Folder C:\Documents and Settings\Jeff\Local Settings\Temporary Internet Files\Content.IE5\73PAT3FU\icons.png not found! File\Folder C:\Documents and Settings\Jeff\Local Settings\Temporary Internet Files\Content.IE5\73PAT3FU\icon_expand_close.png not found! File\Folder C:\Documents and Settings\Jeff\Local Settings\Temporary Internet Files\Content.IE5\73PAT3FU\icon_users.png not found! File\Folder C:\Documents and Settings\Jeff\Local Settings\Temporary Internet Files\Content.IE5\73PAT3FU\ifm.htm not found! File\Folder C:\Documents and Settings\Jeff\Local Settings\Temporary Internet Files\Content.IE5\73PAT3FU\iframe_20101028165000.js not found! File\Folder C:\Documents and Settings\Jeff\Local Settings\Temporary Internet Files\Content.IE5\73PAT3FU\index.php not found! File\Folder C:\Documents and Settings\Jeff\Local Settings\Temporary Internet Files\Content.IE5\73PAT3FU\ipb.js not found! File\Folder C:\Documents and Settings\Jeff\Local Settings\Temporary Internet Files\Content.IE5\73PAT3FU\ips_config.js not found! File\Folder C:\Documents and Settings\Jeff\Local Settings\Temporary Internet Files\Content.IE5\73PAT3FU\ips_emoticon.png not found! File\Folder C:\Documents and Settings\Jeff\Local Settings\Temporary Internet Files\Content.IE5\73PAT3FU\itxt_1382536355.js not found! File\Folder C:\Documents and Settings\Jeff\Local Settings\Temporary Internet Files\Content.IE5\73PAT3FU\jquery.min.js not found! File\Folder C:\Documents and Settings\Jeff\Local Settings\Temporary Internet Files\Content.IE5\73PAT3FU\loading.gif not found! File\Folder C:\Documents and Settings\Jeff\Local Settings\Temporary Internet Files\Content.IE5\73PAT3FU\metrics_1329390699.js not found! File\Folder C:\Documents and Settings\Jeff\Local Settings\Temporary Internet Files\Content.IE5\73PAT3FU\mia.gif not found! File\Folder C:\Documents and Settings\Jeff\Local Settings\Temporary Internet Files\Content.IE5\73PAT3FU\nessie_icon_chevron_white.png not found! File\Folder C:\Documents and Settings\Jeff\Local Settings\Temporary Internet Files\Content.IE5\73PAT3FU\nj-mall_120x48_1383635245.jpg not found! File\Folder C:\Documents and Settings\Jeff\Local Settings\Temporary Internet Files\Content.IE5\73PAT3FU\p1.gif not found! File\Folder C:\Documents and Settings\Jeff\Local Settings\Temporary Internet Files\Content.IE5\73PAT3FU\p2.gif not found! File\Folder C:\Documents and Settings\Jeff\Local Settings\Temporary Internet Files\Content.IE5\73PAT3FU\photo-1153.gif not found! File\Folder C:\Documents and Settings\Jeff\Local Settings\Temporary Internet Files\Content.IE5\73PAT3FU\pixel.gif not found! File\Folder C:\Documents and Settings\Jeff\Local Settings\Temporary Internet Files\Content.IE5\73PAT3FU\PostComLeft.png not found! Double-click OTL.exe to start the program. 2. Enable Protected Mode in Internet Explorer. We installed Malwarebytes AntiMalware, SUPER AntiSpyware and Tweaking.com-Registry Backup. These still reside on the machine and HJT. Should I keep any or all of these? If not, what is the best way to remove them? There are a few other antimalware programs that are on the machine that i really dont use, Spyware Blaster 4.6 and CCleaner, should I update these and use these or remove them, again if remove is the recommendation, what is the best way to do that. I was never able to restore and update Java - I kept receiving a "getdefaultbrowsererror 2:" message so Java is not on my machine. Lastly, I could not find the "Protected Mode" in IE as you recommended. We are running IE 8.
you can remove / uninstall SUPER AntiSpyware and HJT. Malwarebytes AntiMalware and Tweaking.com-Registry Backup are useful tools which you could leave on this pc. If you don't use Spyware Blaster 4.6 and CCleaner, you can uninstall them. 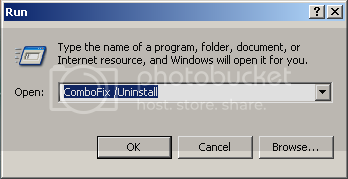 Uninstall is always the best way to remove a programm. Protected Mode in Internet Explorer is available for Windows Vista, 7 / 8 only! Install latest Java 7 update: JAVA Click this link and click on the Free JAVA Download. Please post a list with the names or numbers of the other computers, which are part of the network. I ran the Malware root tool kit and OTL one each of the PC's (not the accounting server) and the Malware Root tool Kit found no malware on any of them. Computer Name: MIKE | User Name: michael | Logged in as Administrator. module unknown, version 0.0.0.0, fault address 0x161158c8. module mshtml.dll, version 8.0.6001.23532, fault address 0x0014c5ab. all looks good for the first PC (M-1). On the next pc: Run OTL and post the logs!